I was never into sports players or pop singers or whatnot, but man, when I was twelve, did I ever have a crush on Queen Hatshepsut (March 10th's Woman of the day). So far this month I've been trying to avoid what I tend to think of as the obvious choices, the ladies who get trotted out every time we want to pay lip service to women's history, but I just can't help myself with this one. The first female pharoah of Egypt and the only one to declare herself king (yes, masculine pronouns and all – she even wore a symbolic beard), I've always thought she was pretty neat. 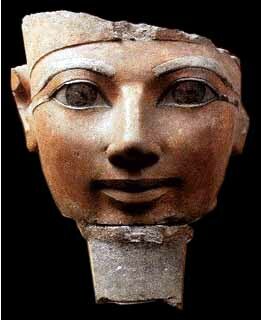 Other women had been regents and queens, but as far as we know Hatshepsut was the first to rule in her own right. If that isn't enough to impress you, she also built a lot of things, established new trade routes, maintained the peace, and yadda yadda yadda. High on the highlights of my life, now and probably always, was visiting her temple in Egypt.